Coverage: Live on BBC Radio Wales, online, mobile and the BBC Sport app. 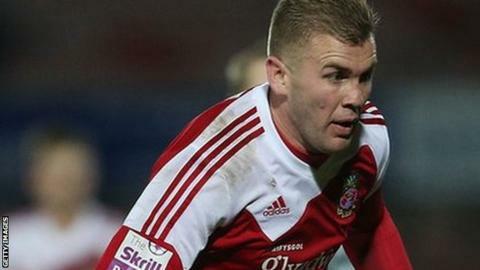 Wrexham manager Kevin Wilkin says he will play wantaway striker Andy Bishop at Barnet if he thinks it will benefit the team. The 31-year-old has not started for the Dragons so far this season and has requested a loan move away from the Racecourse. But Bishop came off the bench in Wrexham's 2-1 win at home to Welling United on Saturday. "Andy's frustrated at not playing games," Wilkin said. "We've had Louis [Moult] up there scoring goals and probably the versatility that Andy can offer for us wouldn't be quite as great as some of the other players. "But I want to take stock of it and see where it goes and if he's right to stick in the side and go and play a game that might well be the case." Bishop has seen his opportunities limited to five substitute appearances because of injury and the summer arrival of Moult and Connor Jennings. Top-scorer Moult netted his fifth goal of the season in Wrexham's 2-1 win over Welling United, but is a doubt to face Barnet, while Jennings has scored twice. Wilkin's side are seventh after beating Welling and they travel to Conference leaders Barnet on Tuesday. "They're a very good side and playing with great confidence but I know what we're capable ," Wilkin added. "If people apply themselves in the right way and concentrate in the manner that we would expect, and we've proved we can, there's no reason to go there and fear the game.""